The App was designed prior to iPhone 5 and has yet to be updated to take advantage of its 4-inch display. Even leaving that out, it uses a non-standard volume slider that is hard to get used to  it take up less than the full width of the display, so it's a smaller target for my finger. Also, the volume control doesn't feel immediately responsive. The EQ and other functions (switching inputs) work well. I imagine they're most useful for a backseat passenger. 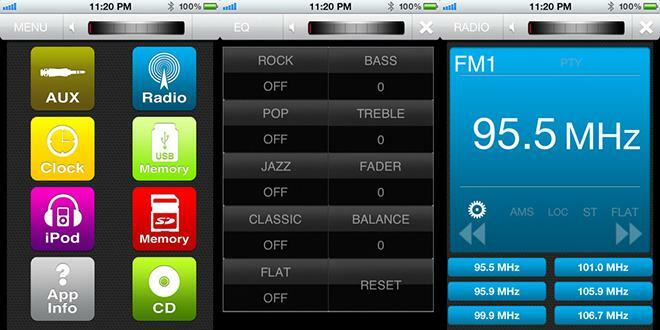 It is easier to adjust EQ on the app, easier to adjust volume with the knob on the radio. One nice benefit of having iOS support? Pairing with the phone causes the radio's clock to be set correctly. Thank you, Scosche, for getting this right. So, how does it work? Actually, reasonably well. Pairing with Bluetooth was quick and about as easy as it is for any other Bluetooth device. Call audio quality wasn't all bad, although I had to remember to turn down the A/C in order for people on the other end of the call to hear me with any clarity. Streaming music from the iPhone worked as expected, although controlFREQ is not using profiles and codecs that would make the Bluetooth audio and calling sound better. Going forward, I expect AAC as the codec for Bluetooth audio and Wideband Speech Profile to be included in any Bluetooth handsfree product that's made - the high quality voice services that are coming about with iPhone 5 and carrier adoption mean now's the time for manufacturers to start including them in products, especially semi-permanent ones like a car receiver. Admittedly, this may be too high an expectation for car audio  the car is very much an imperfect listening environment. When designing car audio, it's possible to tune all the car audio components to perfection when the car is off, but the moment the car is on you have electrical interference (alternator whine! ), road noise, noise from the climate control, all of which ruin the expense spent on tuning the audio properly. It's possible to overcome much of this through expensive DSPs that use microphones and noise-cancellation, but that's very much out of budget for an affordable product today, like the controlFREQ. The good news is that this product is affordable at $120, so for all these features, it's not a huge investment to replace. I acknowledge that the cost of the GM20SR installation kit is not small, but this would be required for any clean installation. 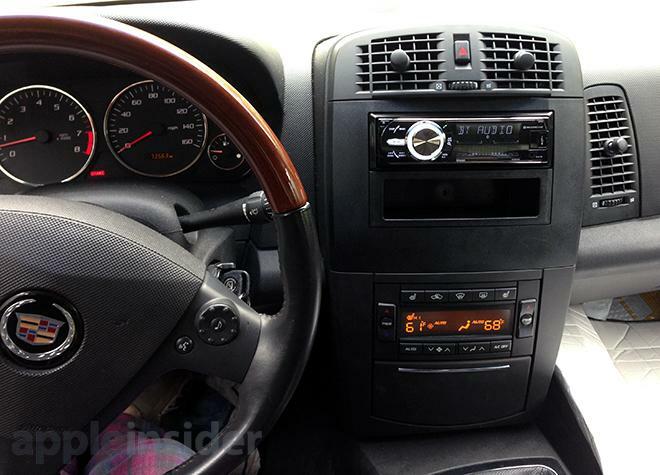 Think of it like this: If I had a nice used car that didn't have handsfree, for about $130-140 (depending on the cost of the dashboard fascia) I could replace the stereo and add handsfree calling to the car. Playing music from my iPhone and having app control are bonuses. What I observe other than my desire for a Siri button is that this product probably works best in a car with less integration and features, one without steering wheel controls and an integrated car system that does more than audio. Cars like this are getting older and even then they have these features. I owned a 2002 Ford Focus SVT which had audio controls on a stalk on the steering column, for example. The phone button on the radio faceplate would have been perfect for prompting Siri (or voice input on Android or Windows Phone for that matter) but it doesn't. Instead, it redials the last number called and answers or rejects incoming calls. I do wish that when streaming audio from Bluetooth to the controlFREQ that the track names appeared on the segmented display. They do not. This would have been a nice touch. Car audio is hard to solve elegantly. As the integration between the entertainment system and rest of the car gets tighter, it gets harder to convince people to give up the stock system and spend the time and money to install an aftermarket product. The other problem with car bound accessories is that many of them have their own application on the App Store. This is great until you have more than one. That is, if I'm using a navigation app, running an app-enabled radar detector, and using a streaming music service for my music source, but need to switch to the car radio app to control the EQ, I'm now out of navigation context when I really ought to be driving. Switching apps requires reaching for the phone unless you can prompt Siri. This is why I like driving with Siri, which isn't available in this head unit. This is a good radio for a car whose other services aren't tightly integrated into the stock entertainment system. It's affordable, does what it sets out to do, and does it well  I just wish it did a little more. The Scosche controlFREQ is available now for $119.99 directly from the company's website.